Chris Christie campaigned with Charlie Baker in 2010. Distress over the “slide of the party” fueled his decision to endorse Governor Chris Christie of New Jersey after months of neutrality in the Republican presidential primary race , Governor Charlie Baker said Friday. Baker declined to say whether he would support or vote for one of his party’s more conservative, populist candidates if Christie did not prevail. But he singled out billionaire Donald Trump and US Senator Ted Cruz of Texas, who won the Iowa caucuses on Monday, as his sources of concern. “Coming out of Iowa, my conclusion is that one really needs to be able to get along and work with people on both sides of the aisle and have a proven record of doing that, and I don’t see that in the front-runners,” Baker said. Baker and Lieutenant Governor Karyn Polito will appear with Christie at a rally Saturday morning in Bedford, N.H., and then return to Massachusetts, a Baker adviser said. He is also willing to make television appearances for Christie to explain his support, the adviser added. Baker, whose gubernatorial campaign received more than $11 million from a political organization that Christie then chaired, praised his New Jersey counterpart’s executive skills and ability to work with Democrats. He said the Republican Governors Association’s investment in his 2014 bid did not factor into the decision. Governor Charlie Baker is endorsing New Jersey Governor Chris Christie’s long-shot bid in the GOP presidential primary. “I’ve been talking to Chris Christie, to Governor Christie, about politics and state government for a long time. That was, for me, along with some of the results coming out of Iowa, the driving factor,” he said in a telephone interview. Those conversations included tips from Christie last year as Massachusetts faced historic winter storms, based on New Jersey’s experience in 2012 with Hurricane Sandy, Baker said. “He’s given me an enormous amount of advice over the years about one thing or the other,” he added. After a crushing loss in 2010 to Democratic incumbent Deval Patrick in the governor’s race, Baker drastically reshaped his political identity in 2010, courting Democrats and campaigning in primarily minority neighborhoods. He angered the state party’s conservative base, but won over enough independents to recapture the corner office for the GOP after eight years of Democratic rule. Baker had long resisted injecting himself into Republican politics outside the state. Associates say the governor is aware of the unpopularity of the national GOP brand in his more moderate home state. He has occasionally criticized Trump when, he said, the GOP front-runner has gone too far. “My view all along on this was to not get involved, but I have been concerned about the slide of the party,” Baker said. But even in backing Christie, Baker refused to take the step of rejecting Trump outright if he were to secure the nomination. “We have no idea what’s going to happen between now and the end of the process, and I think there are a lot of cards that are going to turn over, over the next four or five months,” Baker added. Baker’s nod may prove too little too late for Christie, who, after a brief surge, has been sagging in the polls. A CNN/WMUR poll of likely voters in the New Hampshire Republican primary released Thursday showed him dropping to 4 percent. Baker said he had told Christie of his decision to go public with his backing recently, but could not pinpoint exactly when. He said next Tuesday’s first-in-the-nation New Hampshire primary helped shape the timing of his announcement. In 2014, when Baker was locked in a tight gubernatorial race with then-Attorney General Martha Coakley, Christie helped steer political assistance his way. The Republican Governors Association, which Christie chaired at the time, invested more than $11 million in the Massachusetts race, part of a $130 million outlay that year, according to the group’s records. 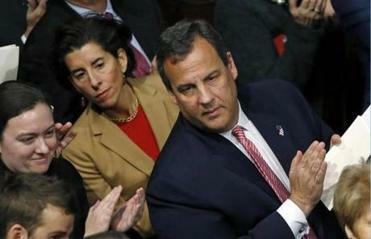 Christie attended Baker’s inauguration ceremony in January 2015, adding the star wattage of a future presidential candidate to the governor’s first day in office. A Morning Consult survey of all 50 states found that no governor’s constituents viewed him or her more favorably than did Baker’s, allowing Christie to trumpet support from America’s most popular governor. The move could burnish Baker’s profile back home as a moderate Republican resistant to his party’s far right. Others in the state’s GOP establishment have scattered among several candidates. Former governor Mitt Romney, the party’s 2012 presidential nominee, has not endorsed any candidate. Baker’s pick of Christie also comes as something of a blow to others from the governors’ class in the field. Christie, Governor John Kasich of Ohio, and former Florida governor Jeb Bush have been vying with Senator Marco Rubio to capture establishment-minded voters. While Baker associates had long buzzed that Christie was the candidate most likely to receive his support, the governor had been publicly noncommittal about the race. “It seems to me like we haven’t had a caucus or a primary yet, and a long way to go, and I like what some of the candidates have to say and I don’t like what some of the candidates have to say, and we’ll see where it goes,” he said during a December interview. Both governors were in attendance Thursday night for the Bruce Springsteen concert at the TD Garden, though the two did not cross paths, the Baker adviser said. Baker said he has known Christie for five years, has never spoken with US Senator Marco Rubio of Florida, had not reached out to Governor John Kasich of Ohio, and had recently apprised former Florida governor Jeb Bush of his decision.